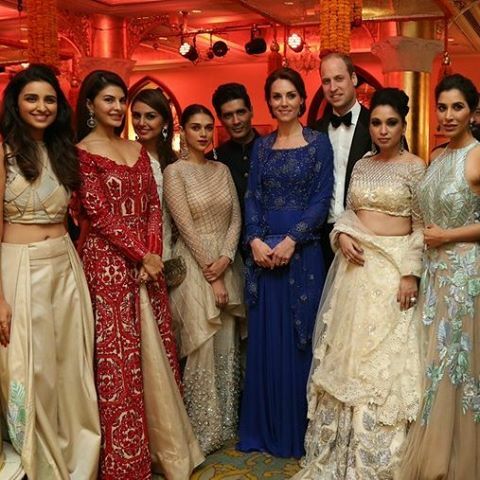 Kate Middleton & Prince William in Star Studded Bollywood Affair! There is no better twist to a royal visit if it is not mingled and jingled with the exquisite bling of our beloved Bollywood. We recently updated you on the how Kate scored a six with Sachin Tendulkar and William loved to kick a few goals at slums, in the first half of their visit to India, yesterday. 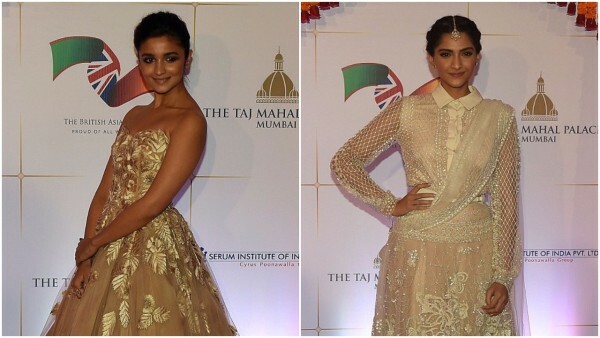 Now let us take a look at the full blown Bollywood affair, that was to be their glam quotient at night, a terrific grand finale to their first day in India. 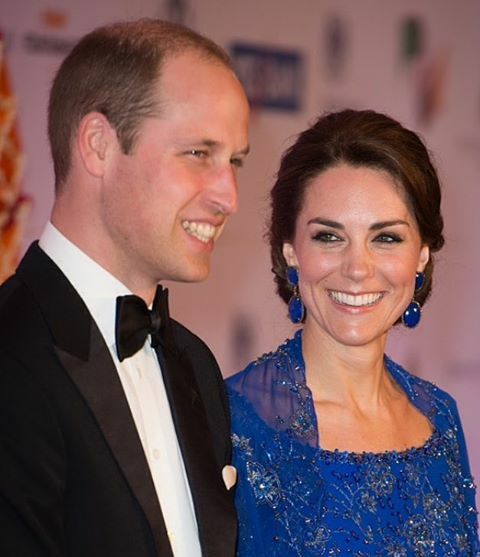 The Duchess absolutely blew our minds away in the Jenny Packham sapphire blue bespoke gown, which she complemented with Amrapali earrings, and hair swept in an elegant chignon bun. Prince William accompanied her in his usual dapper way, oozing royalty in his conduct, wearing a black tuxedo. These two really are a pro at making statement, don’t you think? These two really are a pro at making statement, don’t you think? The full blown Bollywood dinner had superstars to the likes of Shah Rukh Khan, Madhuri Dixit, Aishwarya Rai Bachchan, Parineeti Chopra, Aamir Khan, Rishi Kapoor, and the biggies of the business world and industries. 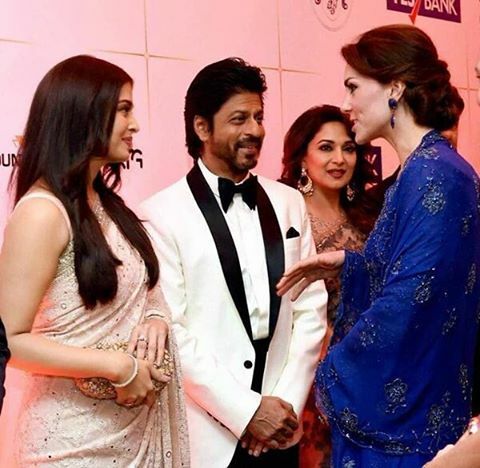 The Duke and Duchess seemed particularly taken by the charms and wits of King Khan who complimented Kate on her elegance and beauty, and wished the duo could stay longer in India. 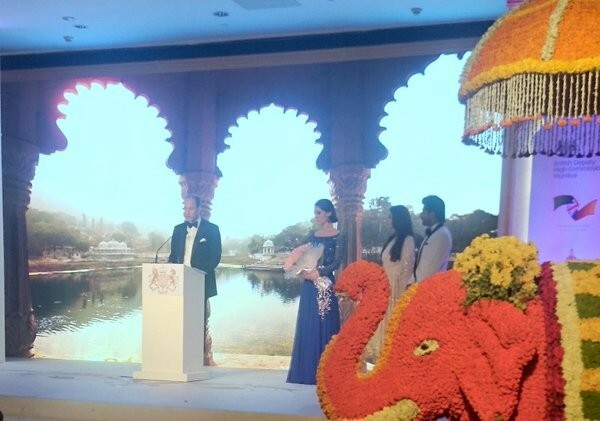 Prince William was flanked on the sides by Aishwarya Rai Bachchan, and Mrs Rachnee Sarna, wife of the CEO of Taj Hotels Rakesh Sarna, while the Duchess was treated to the company of Shah Rukh Khan and Adar Poonawalla, who is the CEO of Serum Institute of India, for the evening’s seating arrangements. Sigh! Well, we believe one really has to be born special and be special to be seated in this dream setting. 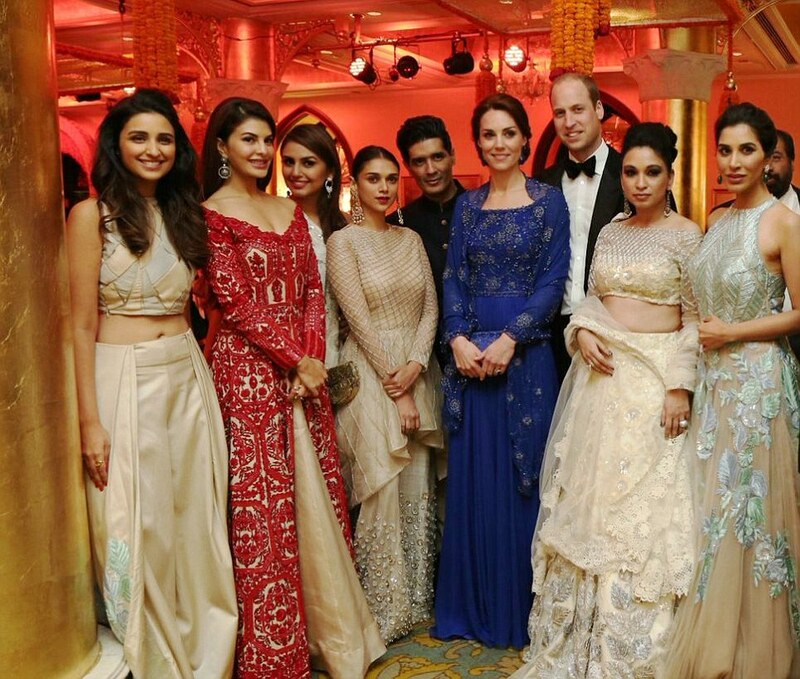 The evening was catered with sumptuous Indian cuisines for the royal couple. Various Indian delicacies were served with relish, and were a perfect mix of vegetarian and non-vegetarian food to give the Duke and Duchess a perfect sum-up of the desi flavours, topped with love and hospitality. 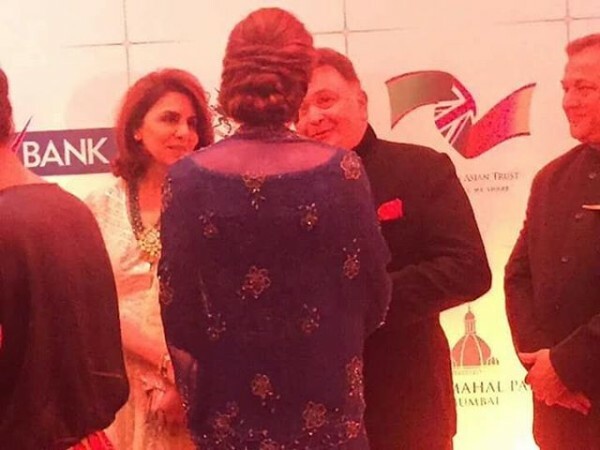 The dinner had been co-hosted by British High Commission and British Asian Trust, and the proceeds from which are to go to the three charities of Duke and Duchess; Doorstep, Magic Bus, and Childline. The visit of the royal couple is already creating exciting waves. We just can’t wait to know about and cover the rest of the tour. If the start is so explosively juicy, think what would be next!